Written by CMOS Bulletin SCMO on July 9, 2018 . Posted in Climate, News & Events, Oceans, Weather. Earlier this month, the 52nd Annual Congress took place in the beautiful seaside city of Halifax, Nova Scotia. Attendees from across Canada and around the world gathered in the new downtown Convention Centre during June 10-14, participating in scientific programming and enjoying East Coast hospitality. Each year, the Congress brings together academic researchers, professionals and partners from across Canada to share research, best practices and discuss scientific advances under a different theme and in a different city. 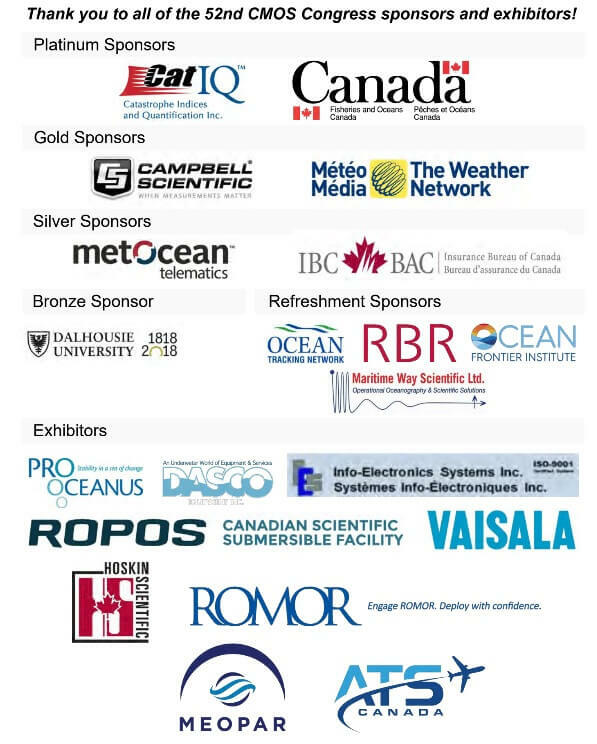 This year’s Congress was held in conjunction with the Marine Environmental Observation, Prediction and Response Network (MEOPAR), a Network of Centres of Excellence hosted in Halifax that funds research, trains marine professionals, and connects with partners and end-users in the area of marine risk and resilience. The partnership arose through the alignment of organization’s mandate with this year’s Congress theme of marine risks and impacts. While June 11 was the opening day of Congress programming, early birds were rewarded the prior evening with Celtic music, Nova Scotian beer and wine, and local delicacies like donairs and oysters at the East Coast Icebreaker. Hundreds of delegates took the opportunity to visit the exhibitors’ booths and visit with new acquaintances and old friends. Earlier in the day, participants attended the GOES-R Weather Satellites workshop, a student pitch talk and meet-and-greet, or explored the streets of Halifax before the Congress was underway in earnest. The Congress ceremonies opened with a traditional prayer and drum circle led by Debbie Eisan, an elder at the Mi’kmaw Friendship Centre in Halifax. Attending dignitaries included CMOS President Wayne Richardson; David Grimes, Assistant Deputy Minister and head of Environment Canada’s Meteorological Service; Bill Horne, MLA for Waverley-Fall River-Beaver Bank and Ministerial Assistant to the Minister of Natural Resources (Forestry); Dr. Alain Vézina, Regional Director of Science, Maritimes Region, Fisheries and Oceans Canada; and Waye Mason, Deputy Mayor of the Halifax Regional Municipality. The opening ceremonies set the scenes for a week that incorporated a focus on traditional indigenous knowledge along with scientific research and workshops. Organizers and attendees alike highlighted the indigenous focus and strong youth presence as key elements that made this year’s Congress particularly memorable. Left: The Fine Tuners – musical entertainment at the Icebreaker and the banquet. Eriel Tchekwie Deranger, Executive Director of Indigenous Climate Action, delivered one of the week’s plenary talks and chaired an indigenous knowledge panel, and sessions throughout the week incorporated indigenous relations, outreach and knowledge in their subject matter and presenters. Ms. Deranger spoke eloquently on the rights of indigenous communities, highlighting the importance of speaking with First Nations early on, and listening to their knowledge and perspectives. Incoming president Paul Kushner picked up on the theme, emphasizing the need for sustainability as a model for CMOS. Kushner was pleased to see the energetic and engaged youth contingent participating throughout the week on panels, as volunteers, and in social activities, including a student boat cruise, an employer tour and networking event, and an all-day science communication workshop. “We have a chance as an organization to address the issues of the day—that’s what motivates young people, and that’s what will help us to keep CMOS relevant in the years to come,” Kushner said. Each year Congress includes a public lecture, encouraging the general public to learn more about an area of study connected with CMOS. This year’s topic was the North Atlantic Right Whale crisis afflicting Canada’s eastern shores, delivered by Dalhousie University’s Dr. Chris Taggart. Presented at Halifax’s downtown public library branch to a full house, the lecture explained the difficulties in tracking right whales, the technological advances that have enabled new discoveries in right whale behaviour, and the manmade hazards that are killing an already critically endangered species. Left: Patterson Lunch – David Grimes presenting the Patterson medal to Bill Appleby. Centre: Eriel Deranger’s plenary presentation on climate change and indigenous communities. Right: Changing of the guard – CMOS Past President Wayne Richardson presents presidential medal to Incoming CMOS President Paul Kushner. The Patterson-Parsons luncheon and the Wednesday evening banquet were, as usual, can’t-miss events. At the luncheon on Tuesday, Mr. William Appleby (Patterson Medal) and Dr. Andrew Trites (Parsons Medal) were recognized by their peers for their important work. Hundreds of lobsters (and a few chicken dinners) were accompanied by rollicking Celtic tunes from Nova Scotian musicians “The Fine Tuners,” as guests celebrated deserving award recipients and commemorated CMOS members who had passed away in the preceding year. Other notable events throughout the week included a robust list of well-attended plenary talks, enthusiastic panels and town halls, two busy and lively poster sessions, the exhibitors’ hall, and joint programming with MEOPAR’s Annual Scientific Meeting on the last day of the Congress. Left: An interested audience at the 2018 Public Lecture by Dr Chris Taggart on the North Atlantic Right Whale Crisis. Right: One of the poster sessions, with lots of student engagement.